Every year, Year 7s take part in a full day off timetable focussing on Religious Education and interfaith topics. The Faith & Belief Forum delivers our Art of Empathy and Art of Asking workshops, alongside workshops run for the students by the local Sikh and Hindu communities, with an enormous impact for the young people. Taking place, as it does, at the beginning of their school career, it gives them a foundation for the rest of their RE experiences in school. What they have learned in the sessions, from how to ask questions about faith to specific facts learned about the faiths themselves, are frequently referenced in RE lessons for a long time afterwards. The workshops and support that the Faith & Belief Forum has offered to Ferryhill has transformed the school’s experience of interfaith and intercultural difference. 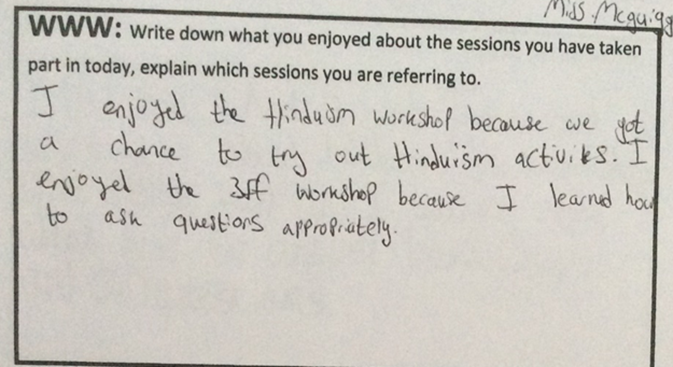 Some of the students have never met anyone from another religion before taking part in a Faith & Belief Forum workshop, but their understanding of other faiths is vastly improved as a result. The school itself reports that, while there was some Islamophobia within the school environment five years ago, there is now very little displayed across the school. To support the Faith & Belief Forum to deliver more of this crucial work in schools across the country, please become a Friend of the Faith & Belief Forum.